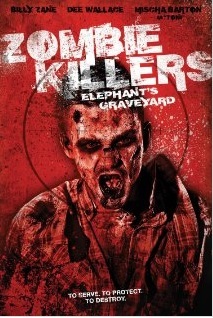 Zombie Killers: Elephant’s Graveyard lumbered its way onto our list of the worst horror movies of 2015…and what with the choruses of vitriol this thing received, we certainly weren’t belting out our disapproval a cappella. If you’ll excuse the extended, battered, bloodied metaphor, no piece of art can stand on its own, and luckily for Zombie Killers it was a cohesive song (if no toe-tapper) when compared with the one note blown by the likes of “worst” nominees Sharknado 3 and Ebola Zombies. This one was a borderline inclusion in our list at the time because of its attempt to upturn the apple cart when it came to the typically rotten zombie genre. So…Zombie Killers: Elephant’s Graveyard gets a revisit, whereas the other two will only be watched under extreme prejudice and/or duress. Besides, director Harrison Smith is a real mensch, and we’re excited about Death House, just like nearly every other gorehound on earth. What was initially off-putting about this film was the front-end loading of voice-over. At the best of time, this device is a grind, so when we first encountered Zombie Killers (henceforth ZK), that’s what stood out — and given how many zombie movies we’d seen during that stretch of reviews and how sorta stale the genre had become, the entire visual spectrum blended into one muddy unmemorable whole. So…that movie…the one with the voice-over…was the one that got the beat-down. In ZK, a militia who train with paint-ball equipment during zombie killing downtime are resigned to cope with their fate as members of their ranks, holed up in a slapdash “town,” become infected. They care for the sick, then occasionally “evict” some of their elderly residents, a bit like how members of that cohort are shunted off to long-term care facilities. ZK really plays up the drama about who’s doomed to die. It’s an interesting conceit, glossed over upon first viewing. 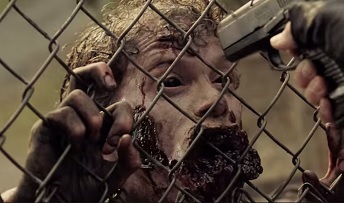 Sure, other zombie / contagion flicks deal with this too, but not with this kind of grim practicality and pathos. There are also interesting discussions about the whys of making these “evictions” public, a definite nod to the death penalty and among the more interesting bits of chatter overlooked. The ad hoc town is at the mercy of the GP, “Doc,” whose equipment and breadth of knowledge cannot even begin to deal with the public health emergency residents of Elwood have to deal with. The barbarian hordes are at the gates, and ZK meta-references films of its type: “They’re walking like movie zombies,” etc. It’s a conceit we still feel detracts from the drama. So is Zombie Killers among the worst films of 2015? No. It’s got a few neat ideas, marred by pacing issues and lack of bona fide scares (with a few exceptions). Two and three quarters to be perfectly accurate. This entry was posted in Horror and tagged 2010s movies, zombies by Really Awful Movies. Bookmark the permalink.